Side wall between differentiating vessel members. BSA Plant Images Online - Side wall between differentiating vessel members. Secondary wall deposition not yet evident. 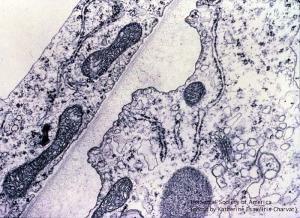 In the older cell (below), microtubules concentrate near young helical thickenings and are absent along the primary wall. Side wall between differentiating vessel members. Secondary wall deposition not yet evident. In the older cell (below), microtubules concentrate near young helical thickenings and are absent along the primary wall.